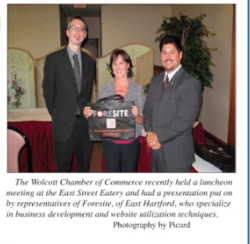 The Wolcott Chamber of Commerce recently held a Luncheon which featured a presentation given by representatives of ForeSite Technologies. Tracy Fox, Director of Sales and Rich Orpheus, Business Development Manager of ForeSite Technologies, an IT Support and Web services firm based in East Hartford CT, presented a compelling program "Using the Internet to Generate Business" at a recent Wolcott Chamber of Commerce Lunch and Learn, at the East Street Eatery in Wolcott, CT. Members learned about social media reach, calls to action to make an effective website, and how promoting content can turn a website from a passive to active marketing tool. “Thank you for presenting what I considered to be a very valuable speech, packed from front to end with gems of information,” Chamber Member, Fred Townsend said. Handout’s from the event can be downloaded at foresitetech.com and include “10 Questions to Determine if Social Media Marketing is Right for You” and “10 Tips for Developing an Effective Website”. Those interested in learning more about improving their website can also download ForeSite’s free web health assessment. For more information about ForeSite’s IT support or web development services, please contact Rich Orpheus at ForeSite 860-528-1100. For more information about The Wolcott Chamber of Commerce, please contact Linda DiMatteo at 860-584-4132. Since 1997, ForeSite has been designing and developing standout Web sites and providing insightful IT support to its clients. Serving clients in the northeast region from their Hartford, CT and Worcester, MA offices, ForeSite offers practical, tailored and creative solutions that fit a wide range of business needs. For further information, call 1.866.464.7483 or visit http://www.ForeSiteTech.com.